One of the great delights of being part of the NCF team is the joy of seeing children operated on in previous years return to clinic; often this is because they have had corrective cleft lip surgery and are coming back for a palate repair but sometimes parents bring their children back just so that we can see their new smiles! In January 2019 we saw Twinkle again. We first met her during the 2018 outreach when she was three months old. She had been born with a cleft lip and palate, picked up antenatally on Ultrasound, but her parents were unable to afford surgery for her. They heard about the work of the NCF through another family living in the same village whose child had been treated by the charity. Following contact with the Rotary Club of Nagpur West [who promote and co-ordinate the outreaches in India] they came to Mure Memorial Hospital for treatment, travelling 5 hours from their home in Akola, 250km away from Nagpur. Families can travel up to 400km to be seen. Information about the outreach is disseminated via local health workers, adverts in newspapers, leaflets, banners and word of mouth. Twinkle’s family described being upset and worried when she was born, uncertain as to how her cleft would affect her future. She did not have major feeding issues but did have nasal regurgitation. Unlike many of the children we see she was not significantly anaemic and was relatively well nourished. Twinkle’s father worked in the construction industry. Many of the parents of children seen are daily workers – often employed in farming and construction work. Not working means not getting paid and potentially not being able to put food on the table. This can act as a deterrent to families bringing their children long distances when they know there is a hospital stay of two to three days involved. Compensating families for loss of earnings was introduced on the last outreach to hopefully militate against this. 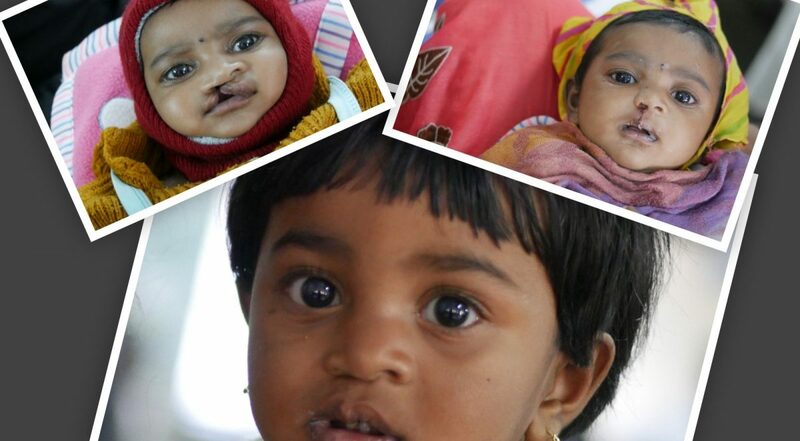 Following the cleft lip repair Twinkle’s parents described feeling “very happy and proud” when they saw her. We were delighted to see her again – thriving with a wonderful result from her surgery. Now fifteen months old she had been brought back for her palate repair, as advised last year. She had not yet started speaking and hopefully this timely intervention will mean her speech develops normally, as having a repaired intact palate will mean that Twinkle will be able to articulate sounds better. Following her cleft palate operation she was seen by the NCF speech therapists who advised her parents on how to encourage her to speak clearly.